Control - This is the ability to contract the muscle without the use of other muscles (the jaw, the neck, the trapezius, the shoulders). In other words, the ability to isolate the muscle. But an even better test of control is the ability to contract the occipitalis muscle and hold this contraction for 10 seconds. If a person can do this, full control is definitely established. Strength - This is the degree in which a person can contract the muscle. A person with great strength in the occipitalis muscle will feel a powerful pull backward on the scalp (the galea) when this muscle is contracted. The test for this backward pull is easy. Place the fingers of both hands firmly on the top of the head. Now contract the occipitalis muscle. 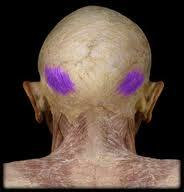 If you indeed have strength in this muscle, you will feel a forceful backward movement of the scalp. This movement will be a quarter of an inch. Tone - This is the way the muscle feels to the touch. The test for this is also easy. Place the fingers of both hands over the occipitalis muscles - both bellies of this bisected muscle. Now contract the muscle. If you can feel the muscle bunch up strongly under your fingers, you have good muscle tone. But if the muscle feels mushy and thin, you have work to do. It can take up to three months of work to establish tone in this stubborn, little-used muscle. Atrophy - This is a state of muscle underdevelopment. In fact, it could mean that the muscle body is actually missing. All that is left is a ligamentous or tendinous band outlining the place where the muscle use to be. The muscle can definitely be regenerated but this can take many months, or even longer, if a person is older - over 40 years of age. The correction of true muscle atrophy is always a difficult task. The task is worthwhile, though, for the occipitalis muscle. Success will bring many benefits. Here is a rather scary photo of the occipitalis muscle. The muscle and its attachments extend almost to the top of the ear. Knowing where this muscle is will help in the tough task of gaining control of it. Even though this muscle is relatively small, after several months of correct exercise it will become amazingly strong. You will feel its strength if you place your hands at the top of the scalp as you contract this muscle. The pull on the galea, the tendinous membrane that connects the muscles of the front and back of the scalp, will be enormous. A few people gain control of this muscle right away but for most people it takes weeks or even months to feel even the slightest contraction. It's easy to get frustrated and to think about giving up on the task. The truth is, though, that everybody who persists, eventually gains control of this extremely subtle muscle. I know this because of all the emails I get from those who finally do succeed. Stay with it and you'll succeed too.